Your vehicle relies on its water pump to help regulate the temperature of the engine and all its vital components. Your water pump is an extremely important component to your vehicle’s internal cooling system and needs to be maintained like many other parts of your vehicle. The water pump tends to be a maintenance requirement that many people commonly overlook. Water pump failure can cause tremendous damage to your engine, which makes it an integral part of regularly scheduled vehicle maintenance. Ron’s Auto and RV provides many water pump repair and cooling system services for your vehicle including diagnosis, repair, replacement and installation services. 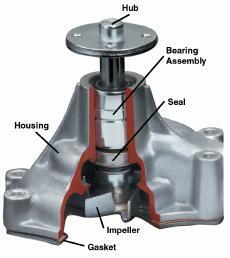 What is a water pump? Why is it important for my vehicle? The water pump is the part of your vehicle’s cooling system that is responsible for dispersing coolant or antifreeze in a cycle through the engine to the radiator and back so that your engine does not overheat. Additionally, the timing belt or accessory belt in your vehicle is responsible for keeping your water pump running smoothly so both components need to be in proper operating condition in order to ensure optimal vehicle performance. How do I know if I need water pump repair? Usually, you will need water pump repair or replacement between 60,000 and 90,000 miles. However, this time frame is dependent on the quality of water pump your vehicle has and the amount of use your vehicle is accustomed to. Water pumps are typically replaced along with your timing belt or accessory belt. There are signs that will indicate your water pump needs to be replaced. If coolant build up appears or begins to drip from your water pump then it is time for a replacement. If your water pump begins to make unusual noises, starts to squeak, if your vehicle starts overheating, or if you find coolant in your driveway it is most likely you have a worn out or defective water pump. Depending on the condition of your cooling system upon inspection we may suggest replacing the belts and hoses associated with your water pump. Your safety is our top priority and we will make sure that no services are performed on your vehicle that are not absolutely necessary. Please contact us today for more information or to set up an appointment. We appreciate your business.